Properly outfitting your therapy practice with functional treatment furniture is essential for your patients and your staff. From simple revolving stools, to electric hi-lo mat tables designed to facilitate your therapy techniques, we have the treatment furniture every clinic needs. Economy, hardwood and hi-lo tables, offer a wide range of treatment table options for your patients’ comfort and support. Be sure to purchase a revolving stool to provide clinicians with the comfort and functionality that they require as they treat. 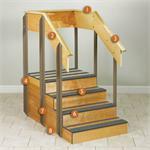 Enhance patient balance, mobility and functional movement with a treatment staircase. Our staircases are designed with sturdy railings and safety treads to help patients achieve clinical goals while reducing the risk of falls. Whether you need treatment tables or staircases, our rehabilitation furniture is perfect for your practice. Choose from our selection of treatment tables, stairs, and stools to complete your clinic today.